Tuf Flooring LLC (Tuf Flooring LLC) maintains this site (the "Site") for your personal information, education and communication. Please feel free to browse through the Site. You may download material displayed on the Site for your personal use only, provided you also retain all copyright and other proprietary notices contained on the material. You may not, however, distribute, reproduce, modify, transmit, reuse, report, or use the content of the Site for public or commercial purposes, including the text, images, audio, and video without Tuf Flooring LLC express, prior written permission. Your access to and use of the Site is also subject to the following terms and conditions ("Terms and Conditions") and all applicable laws. By accessing and browsing the Site, you accept, without limitation or qualification, the Terms and Conditions. You should assume that everything you see and read on the Site is copyrighted unless otherwise noted and may not be reproduced or used in any manner except as provided in these Terms and Conditions or in the text on the Site without the written permission of Tuf Flooring LLC. Tuf Flooring LLC neither warrants nor represents that your use of materials displayed on the Site will not infringe rights of third parties not owned by or affiliated with Tuf Flooring LLC. While Tuf Flooring LLC uses reasonable efforts to include accurate and up to date information on the Site, Tuf Flooring LLC makes no warranties or representations as to its accuracy. Tuf Flooring LLC assumes no liability or responsibility for any errors or omissions in the content of this Site. You understand and expressly agree that your use of http://example.com services and browsing on the Site are solely at your own risk. Neither Tuf Flooring LLC nor any other party involved in creating, producing or delivering the Site is liable for any direct, incidental, consequential, indirect, or punitive damages of any kind arising out of your access to, or use of, the Site. Without limiting the foregoing, everything on the Site is provided to you "AS IS", AS AVAILABLE WITHOUT WARRANTY OF ANY KIND, EITHER EXPRESSED OR IMPLIED, INCLUDING, BUT NOT LIMITED TO, THE IMPLIED WARRANTIES OF MERCHANTABILITY, FITNESS FOR A PARTICULAR PURPOSE, OR NON-INFRINGEMENT. (Check your local laws for any restrictions or limitations regarding the exclusion of implied warranties.) Tuf Flooring LLC assumes no responsibility for the timeliness, deletion, misdelivery or failure to store any content, user communications or personalization settings. Tuf Flooring LLC also assumes no responsibility, and shall not be liable for, any damages to, or viruses that may infect, your computer equipment or other property on account of your access to, use of, or browsing on the Site or your downloading of any materials, data, text, images, video or audio from the Site. You agree to indemnify, defend and hold harmless Tuf Flooring LLC, its affiliates, officers, directors, employees, consultants and agents from any and all third-party claims, liability, damages and/or costs (including, but not limited to, attorney fees) arising from your use of our services, your violation of our Terms of Services (including, but not limited to, a breach of your warranties and representations herein), or your infringement, or infringement by any other user of your account, of any intellectual property or other right of any person or entity. The Terms of Service will inure to the benefit of Tuf Flooring LLC successors, assigns, and licensees. These Terms of Service will be governed by and construed in accordance with the laws of the State of ID, without giving effect to its conflicts of laws provision or your actual state or country of residence. If for any reason a court of competent jurisdiction finds any provision or portion of the Terms of Service to be unenforceable, the remainder of the Terms of Service will continue in full force and effect. Images of people or places displayed on the Site are either the property of, or used with permission by, Tuf Flooring LLC. The use of these images by you, or anyone else authorized by you, is prohibited unless specifically permitted by these Terms and Conditions or specific permission provided elsewhere on the Site. Any unauthorized use of the images may violate copyright laws, trademark laws, the laws of privacy and publicity and communication regulations and statutes. The trademarks, logos and service marks (collectively the "Trademarks") displayed on the Site, including, but not limited to, the registered Tuf Flooring LLC mark and the Tuf Flooring LLC logo, are registered trademarks or trademarks of Tuf Flooring LLC. Nothing contained on the Site should be construed as granting, by implication, estoppel, or otherwise, any license or right to use any Trademark displayed on the Site without the written permission of Tuf Flooring LLC or a third-party that may own such Trademark. Your misuse of any Trademark displayed on the Site, or any other content on the Site, except as provided in these terms and conditions, is strictly prohibited. You are also advised that Tuf Flooring LLC will aggressively enforce its intellectual property rights to the fullest extent of the law, including seeking of criminal prosecution. Furthermore, all information submitted to Tuf Flooring LLC through the Site shall be deemed and become the property of Tuf Flooring LLC, and Tuf Flooring LLC shall be free to use any ideas, concepts, know-how, or techniques sent to or through the Site for any purpose whatsoever including, but not limited to, developing, manufacturing, and marketing products using such information, without compensation or acknowledgment to you. Tuf Flooring LLC may at any time revise these Terms and Conditions by updating this posting. You are bound by any such revisions and should therefore periodically visit this page to review the then current Terms and Conditions. Requests for permission to reproduce the copyrighted material contained on the Site should be sent to the address listed in the following section. Users alone are responsible for the contents of the messages they communicate when using our services and as well as the consequences of any such messages. You agree that you will not use our services for chain letters, junk mail, "spamming", or commercial solicitation or to engage in illegal activities. You represent and warrant that any material you post to or through the Site does not infringe or misappropriate any copyright, trademark, patent, publicity, privacy or other proprietary right of any person. You further agree not to use our services to send any messages or materials that are unlawful or that give rise to civil liability, including but not limited to defamatory, libelous or infringing materials or materials containing computer viruses, Trojan Horses or any other software code designed, intended or likely to cause damage to computer hardware, software or data of Tuf Flooring LLC or any third-party. You hereby consent to Tuf Flooring LLC accessing your account and records on a case-by-case basis to investigate complaints or other allegations or abuse. Tuf Flooring LLC will not disclose the existence or occurrence of such an investigation unless required by law. Violation of these terms may result in immediate deletion of a user’s account. Information posted to or entered into any message centers, message boards, forums or bulletin boards provided on this Site are public and not private communications. Although Tuf Flooring LLC reserves the right to remove without notice any such communications for any reason, Tuf Flooring LLC has no obligation to delete content that you may find objectionable or offensive. 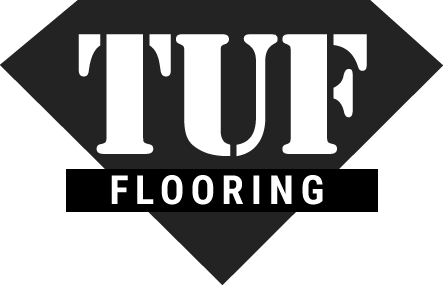 Tuf Flooring LLC may modify or discontinue any services provided through this Site or your account, with or without notice, without liability to you, any other user or any third-party. Tuf Flooring LLC the right to terminate your account if you have provided us with false or misleading registration information, interfered with other users or the administration of Tuf Flooring LLC services or violated these Terms and Conditions.